Congratulations to Dr. Ghassem R. Asrar, named to co-chair the Steering Council for the Agricultural Model Intercomparison and Improvement Project (AgMIP). The Steering Council members represent more than a dozen countries and diverse science perspectives. 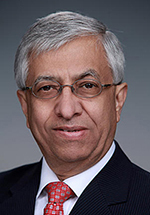 Asrar, world-renowned for his experience in remote sensing and satellites, brings a fundamental understanding of the connections between human activities and Earth's land, oceans, ice, and atmosphere. The Steering Council provides scientific guidance and establishes policies that apply to the broader organization. AgMIP's goal is to improve understanding of world food security as it is affected by climate variability and change. They link climate, crop and economic modeling communities to improve the models and the next generation of projections of climate impacts on agriculture around the world. Their efforts advance integrated models and forecasting future food production and prices to increase climate adaptation strength in developing and developed countries. Since 2010, AgMIP's scientific findings and recommendations have been used in scientific research, development, and international assessments. At PNNL, Asrar is the director of the Joint Global Change Research Institute, a partnership between PNNL and the University of Maryland. Prior to his position at PNNL, he was the Director of the World Climate Research Program in Geneva, Switzerland, from 2008-2013. He has a master's degree in civil engineering and soil biophysics, and a Ph.D. in environmental physics from Michigan State University.